8.5” x 11” Fine Art Photographic Print. This photo was taken in March, 2008. 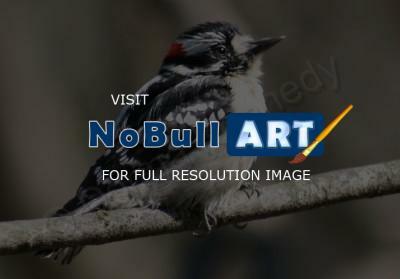 The Downey Woodpecker is the smallest and most common American woodpecker. They're found throughout most of North America from Alaska to Florida. The Downey lives in many different habitats from wilderness forests to urban backyards, and comes readily to bird feeders. You can easily spot a male Downey as he's got a red patch on the back of his head. The female has no red at all. Only a black patch on the back of her head. Usually when these guys arrive at my feeders they call out a sharp note of "pik" "pik". They also emit a harsh rattle or whinny. Widespread and abundant!! May be slightly increasing in some areas. I love to hear that our wildlife is on the increase.